Durable storage box features three compartments for maximum organization. Minimum purchase quantity is 12 units (one display). * C-Line is now shipping the new Tropic Tones color palette (shown in image). Your supplier will begin shipping these new colors when their current Jewel Tone inventory is depleted. Durable storage box features three compartments for maximum organization. 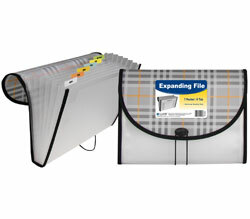 Large bottom compartment is ideal for office and school supplies. Two compartments in the lid hold smaller items. Assorted Tropic Tones colors include Seaside Blue, Sunny Yellow, Seafoam Green, and Sunset Red. Minimum purchase quantity is 12 units (one display).